Over eighty percent of today’s trading is automated. Before arguing this number, don’t think of only the HFT (High-Frequency Trading) industry. While responsible for a big chunk of it, retail automated trading contributes to it too. Trailing stops, for instance, is an automated approach to manage the risk in a trading account better. The HFT industry processes impressive numbers of trades every millisecond. Thousands of trades are traded when critical economic data comes out. But the retail industry wanted something similar. While the size of the retail market isn’t that impressive (merely six percent of the five trillion dollars that change hands every day on the FX market), running automated systems tempted traders. As such, Expert Advisors appeared. Programmers back-tested strategies and built trading algorithms to execute trades automatically. However, sometimes the market keeps moving and moving in the right direction, forming strong trends. Traders feel sorry for closing the trade too early and look for another approach. Using trailing stops is a way to protect capital and to make the most of a strong trend. 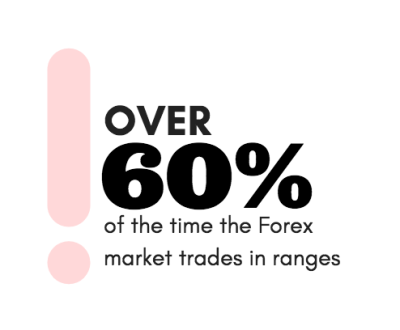 The trading platform automatically executes all of these pending orders (stop-loss, take-profit), further increasing the scope of automated trading. 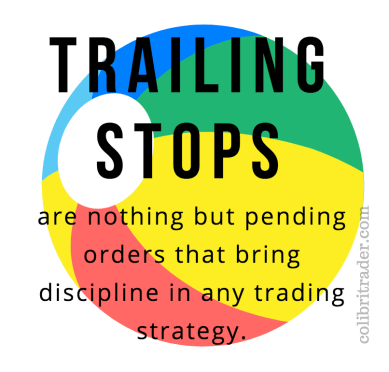 Why Do Traders Use Trailing Stops? Trailing stops help better manage a position. Using them is a conservative approach designed to protect the capital in the trading account. Because the currency market is volatile, sometimes it swings higher or lower on no news at all and trips stops placed at psychological levels. trailing stopsAs I’ve mentioned about trading algorithms, merely watching the price action anyone will notice the algos’ tripping stops on recent highs or lows, only for the market to reverse afterwards. 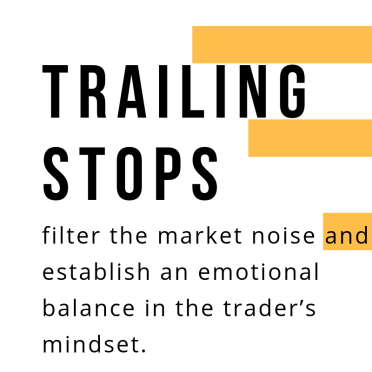 Trailing stops filter the market noise and establish an emotional balance in the trader’s mind. Trading financial markets is a risky business and doesn’t suit everyone. When thinking of trading, most people think of just sitting in front of computers, placing a few orders and making money while doing nothing. While that may be true in movies, real life cannot be further away from that. In reality, trading is one of the most sophisticated jobs in the world. Because financial markets represent the sum of human actions, they morph into something different every single day, week, month, quarter, year, and so on. 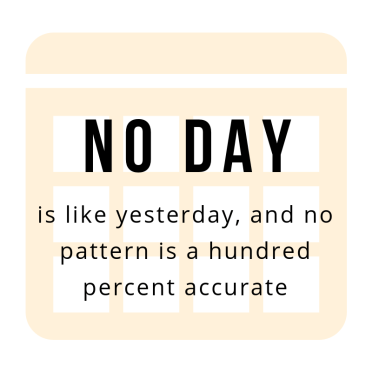 No day is like yesterday, and no pattern is a hundred percent accurate. As such, traders must take precautionary measures first to protect their capital, and only second, to profit from market speculation. This is where trailing stops intervene: they protect the capital and allow traders to make the most out of any given trade. As always, examples help define strategies. In this case, we’ll use the recent EURUSD price action to illustrate how to use trailing stops to make the most of a trade. The pair formed a diamond as a reversal pattern on its last visit above the 1.18 mark. This being the daily chart, what all traders needed to do was to wait for the diamond formation to break lower. From a price action point of view- there was an inside day and also a bullish rejection candle. As it happens, like many other classic technical analysis patterns (head and shoulders, wedges, double and triple tops), diamonds have a measured move too. And that’s the level where traders must decide: either to book the entire position or use trailing stops to make the most of a possible new trend. he measured move of any pattern represents just its confirmation. It merely tells us that the reversal pattern is in place. The market, as such, may or may not continue trending, but consolidating. By using trailing stops orders, traders eliminate the risk of being caught on extended consolidation areas and paying fees and commission for it. While, at the same time, they position for a potential strong trend. First, traders book half the profits at the measured move and trail the stop for the rest. The first place for the trailing stop order is at the top of the breakout candlestick (nr. 1 on the chart below). Next, the best way to make the most of a trend is to trail the stop after every other candle. In plain English, move the stop-loss order to the highest value of the previous two candles. Therefore, the fourth bearish candlestick after the break triggers a stop-loss order marked with the number 2 on the chart above. And, using the same idea, trailing the original short trade is still in place, with a stop-loss at the current time at 1.1549. If this candlestick closes without the stop-loss being triggered, traders would lower the stop to position nr. 8 (the highest value of the last two candlesticks). From the example above, one of the major pros of using trailing stops comes from making the most of a trend. Nine candlesticks after the bearish break (nine trading days) and the trend is still in place and the stop in positive territory. No emotions, whatsoever, influence the trading decision. All a trader needs to do is to sit and wait for the close of the trading day before trailing the stop to the next level. This way, the emotional roller-coaster gets minimised to a very low level. By booking half the profits on the measured move, traders release the much-needed margin in their trading account. They’ll use it on other trading setups (if needed). On that, you can check out my article on overtrading, which you should avoid at all costs. And, by using trailing stops, they protect the trading account from any vicious spikes that may eat away your potential profits. On the negative side, trailing stops aren’t always helpful. Like it or not, even the currency market spends a lot of time in consolidation. trailing stopsIt is known that over sixty or sixty-five percent of the time the Forex market trades in ranges. Trends like the one on the EURUSD shown here do not form that often. If that’s the case, trailing stops won’t help. Instead of closing the entire position when the market reached the measured move, traders book only half of the potential profit, just to see the market reversing and “eating” the rest. That’s frustrating, but still a decent money management system. Remember: No matter what “trading gurus” tell you, trading financial markets is a game of probabilities, with no clear path to success. Another drawdown of using trailing stops is the execution. Slippage might seriously affect the performance of your system. Especially if you are day trading! The broker vows to execute the order if and where there is a market. During major news (check out my article on the 5 Fundamental News that could move any market), the execution differs significantly once price action comes closer to the stop order. Trailing stops are a great money management tool. “Set and forget,” is an excellent description for such orders. Using them makes emotions disappear. No longer traders keep their eyes on the screens to constantly check their positions. On top of that, using trailing stops allows them to focus on the next trading setup and the next opportunity. Hence, trailing stops help traders avoid opportunity costs.